It’s been a while since I’ve been into town super early and had a few hours to kill. Having a few hours to kill always makes it sound like you’ve nothing to do with your life and you’re a sad person. That’s not the case though. But I’m going to go ahead and justify my free hours anyway, by saying that if I hadn’t bothered going into town I’d have just been sleeping those hours away. I prefer to be up and about, even if it means I spend money on things I don’t need. I started out by going to Gusto for one of their amazing raspberry scones and a large cappuccino. I sat there for over an hour probably, reading The Perks of Being a Wallflower. It was nice. The time sort of flew. I even bumped into someone I knew there, Darren, from Canadian arts company Mammalian Diving Reflex. I like that. Just sitting there, and then you see someone you know and have a quick chat. Eventually I left Gusto and wandered out onto the lonely streets. Not really, but they were still pretty quiet. That’s the one thing that annoys me about Cork really. I just find it too quiet at times.. Whenever I’m in town with feck all to do and I’ve already had a fill of caffeine, I just go looking around shops. I bought a few bits in Topshop the other day so I didn’t need to look through that fecking shop again, but I did head into Oasis. They had a sale, which is what attracted me in in the first place. I got a green short sleeved t-shirt. It’s a really nice, almost silky, material and it strikes the perfect balance between fitted and loose. Happy. Then I went to the Crawford art gallery, because I think appreciating art will make me cool. I jest. Nah, I just like the building. It’s nice to wander around inside and just look at whatever exhibition is on. There’s no need to critically analyse every piece, but just kind of absorb all the stuff around you. It’s really peaceful too, which is nice. I love the contrast between the old collection and the newer exhibitions. You walk through those glass doors and it’s like a different world. The exhibition part is all clean, modern lines, high ceilings, quite minimalist. The older parts of the gallery are warmer colours, with plenty of wooden furniture. The art is, of course, hugely different too. After that, I went to Easons. I don’t really know why, to look at books or something I guess? And I did end up buying some book, purely because it was €1.99. ‘We Are Gold’ I think it’s called.. Whatever, I wouldn’t even have a coffee for the price of it. From there I headed over to Plugd to show Albert the article I wrote in the magazine that won the award. He seemed to like it. He laughed a few times, which is always a good sign, and he was pretty impressed with it overall too. Then I listened to some choons, and bought a Sea Lion CD. We had a nice chat, and then Albert told me I should rehydrate before my trek to Kinsale. Maybe he thought I was walking, ’cause getting the bus ain’t that hard.. Still though, I respected the wisdom of my elders and I went to M&S for their savage lemonade, and got a pack of crunchy granola bars in Tesco. And then I went to Kinsale to work in the box office. It was a good day. It crossed my mind at one stage though that I was perfectly content going for a coffee on my own, and wandering around a gallery. I know that some folk might find that a bit intimidating, or they just wouldn’t feel at ease on their own. Not in an oh-my-god-i’m-going-to-be-attacked-slash-abducted way, but just that they wouldn’t be able to enjoy their own company. I’m glad that I can sit on my own and just think, or drink coffee, or organise my week, or read a book, or just watch the world go by. We’re always in a rush, to meet someone, to do something, to get some where. No harm in just stopping every once in a while. I don’t think I’ve mentioned summer much here so far. It’s weird to think that I started this blog on the first day of 5th year, and now it’s almost all over. It seems so long ago that I wrote that first post, but the year seemed so short too. Now though, summer is here, and it’s time to go off the rails and party all night and be the completely carefree teenager like the ones you see in American TV shows. But y’know what? I’m not going to do that. I don’t know what I’m going to do, but it’ll be what I want to do. Summer is always built up to be the HUGE event and non-stop party but I think people get a tad carried away. Calm down, and things will fall into place naturally. It worked for me last year, and I had the best summer ever. I have a few plans for the three months off alright, but I’m not going to into them now or you’ll have no reason whatsoever to read Wintertime Clothes over the summer and that wouldn’t be very good at all would it? Speaking of blogs, I’ve been asked to write a blog during the summer for an organisation I suppose you could call it, so watch this space for more details of that! Today’s the first day that I’ve been properly excited about the summer, and it feels good! I’m looking forward to taking a break, sitting outside cafés drinking coffee, and spending time with certain people. There’s a few other bits and pieces in the pipeline too, such as Kinsale Arts Week. The first volunteer meeting was this evening, and it was so nice to see everyone again and see the new box office and have a catch up. And I got to tell everyone about last year and how it’s such good craic and I’ve been smiling since. I like Sundays. I like waking up a little hungover, and thinking about what happened over the weekend. I like going to Kinsale with my parents and the puppy. I like drinking coffee, and reading the Sunday Times, and going for a walk on the beach. Our little Ozzie is getting so big so fast! Here he is having fun covering my cashmere Topshop vest and vintage jacket in sand. But I love him so I don’t mind..
After I got back from Kinsale I went down to the tennis club with my brother, Liam and Peter, but there was a tournament on so we all went home. Fun times. Later on though, I went over to Aisling’s house because her parents were off in Dublin. So under the guise of a study session, I spent the day there drinking tea, and eating carrot cake and cheesecake. It was nice. 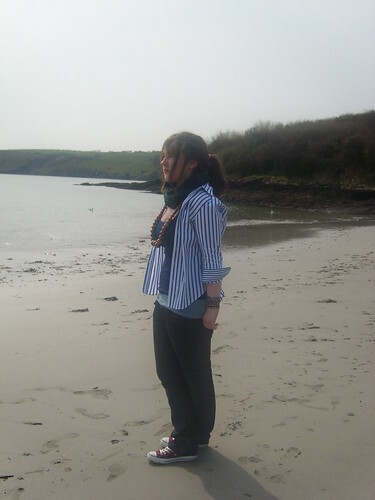 And Aisling took some photos of me so ye could see what I was wearing. And I rather like her front door too..
And here’s another one, just because..
I’ll do Sunday tomorrow, if I’ve time. I’m sure that’s been a blog post title before, but the creative juices are running quite low at the moment so it’s the best I can do. And you can probably also take a wild guess as to what the subject matter of this post is going to be about. Feel free to leave now; I can’t say I blame you. As per usual, we headed to Kinsale yesterday morning, puppy in tow. Had a cappucino and a scone in the Blue Haven while Ozzie stayed in the car. One of the waiters working there sorta fell in love with the last dog so he asked had we gotten a replacement yet. He ended up out on the footpath giving Ozzie plenty of attention. That dog’s such an ice breaker. Need to capitalise on that while I can actually..
Then we headed off to the beach where Ozzie got plenty more attention. He got chased by kids, then chased said kids, and basically got awws wherever he went. While some other family had dognapped our puppy, I made my brother take a photo of me for this. I’m sure I didn’t look vain or pretentious at all..
Home, homework out the back in the sun, Hannah called over to see the puppy, we went playing tennis with Liam, I was class, kept getting such good shots and doing my glance back thing at Liam. No-on could deny my greatness yesterday though. And then I came and didn’t learn an Irish essay on An Chéad Dráma. Even so, I was quite pleased with how that test went today actually.. Better post tomorrow, I promise! I think it’s tradition by now to write a summary of my weekend on a Sunday or a Monday. So here’s the weekly entry to bore you with the inane details of my life. On Friday at 1 the whole year went to Hamlet in the Everyman. This was a rather painful experience that lasted three long hours, but I’ve pushed it to the back of my mind until I’m forced to recall it for some question or other. My parents decided to go out with friends on Friday night so I got to spend a fun night at home minding the child. Although, on the upside, they got me a Pádraigín’s speciality pizza for dinner so it wasn’t all that bad. The consequences of them going out and getting drunk was none other than having to wait around for hours for a lift as my mother attempted to sleep off her hangover. Lightweight. Eventually she arose, and I got a lift to town with her and met Aisling, Aisling and Hannah. We were wandering around when we passed the Crawford and saw that the new exhibition was open, and so popped in for a sconce around. The exhibition was by Backwater Artists Group and is well worth a look if you’re around Cork. And it’s free! We are such recessionistas, like! When we left the Crawford though, it was beginning to drizzle, so the obvious spot to hide from the rain was our favourite coffee shop, and there we headed. The I text a friend, and he came up with another friend of his whom I last saw when I was in a rather merry state. We then walked around town, talking, looking in shops, bumping into various people, avoiding others; just the usual. We sat on Grand Parade, watched a hobo play soccer with three other guys, helped Liam’s sister tidy up the coffee place she works in return for pain au chocolat and Danishes. Fair exchange I think. And we sat eating them, and eating Celebrations and telling stories of people and times gone by. There was a bit of a conversation with a skinny skater dude involving an unwanted Danish, but we’ll just forget about that. Then I decided to go to this 18th that I’d be invited to. So I got the bus with Niamh and Ross and Nicole as far as it would go, and then had a bit of a trek to actually get to the party, but we got there fine. I got a little bit tipsy, talked to old people, talked to new people, danced, shouted, hugged and had a good night. It was a surprise portaay in a free gaff and the place got a bit wrecked, with one room looking like it had been attacked with glowing goo. Which it had been. There were alot of glowing Topshop clothes going home last night.. But it was a fun night, with a different crowd than I’m used to, which was nice for a change. This morning was quite lovely too. I woke late-ish seeing as the clocks had gone forward, but I, unlike my mother the previous morning, managed to get up fine and we headed to Kinsale. I told her about my day in town, about the party, and she was cool about the ol’ Al.Co.Hol. Nice bitta trust developing there. Got behind the wheel for a bit then today, and I’ve hugely improved my starting the car, so my Easter driving is going according to plan. Good weekend. Happy happy happy!